Even though my focus and passion will always be skincare, I get asked so much about the other beauty products I use (makeup, hair etc) and love, that I have decided to start featuring my non-skincare beauty favourites and these products here are everything I have loved over the past couple of months. Ingredients: Top notes – pomelo, saffron, juniper berry. Middle notes – black violet, accord cuir, cristal rose. Base notes – blonde woods, raspberry, vetiver. I have to start off by saying that this beautiful fragrance sadly doesn’t actually belong to me, but ever since I bought it as a birthday gift for my little sister I have been addicted to the alluring scent and have sneakily been wearing it every chance I get. Byredo is easily one of the coolest brands out there and their unique and exciting olfactory creations are like nothing else. It’s hard to pick one favourite out of all the stunning aromas but I have just been loving this one lately. The scent is intoxicating and warm without being too heady and spicy but still fresh and certainly light enough for every day wear. 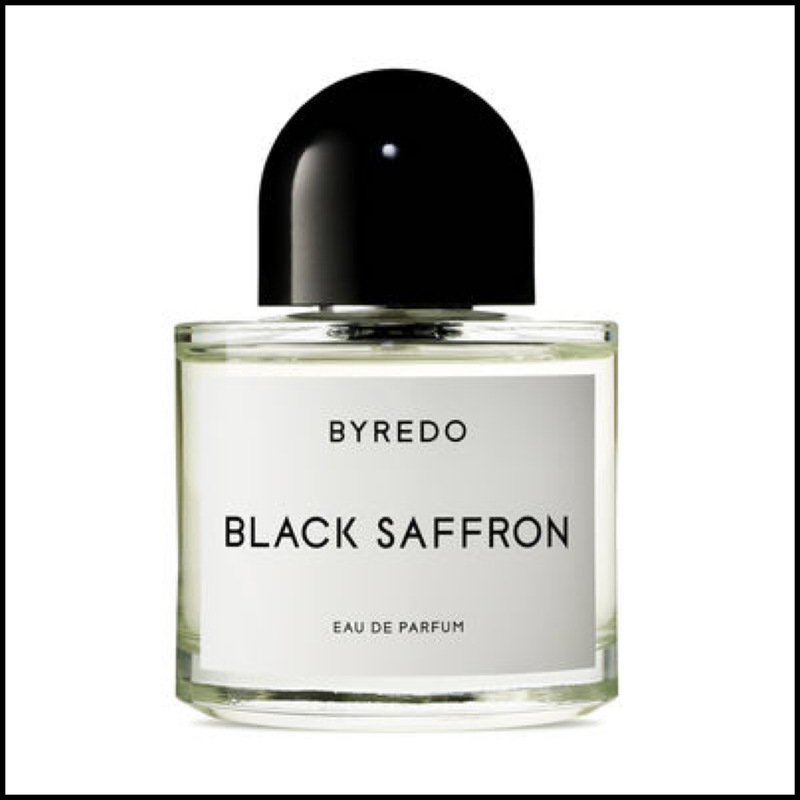 I love that Black Saffron is inspired by the founder, Ben Gorham’s Indian heritage and I think the fact that he grew up with multiple cultural influences and lived in more than one country is what makes Byredo so distinctive. Of course, the chic, minimalist packaging and inventive names are an unbeatable feature but the fragrances themselves are so unusual and worldly that once you try one it’s not long before you are lusting after another. The great thing about Byredo is you only need a spritz or two to be fully enveloped in the scent and it really lingers a long time. Since this has become my sister’s signature summer scent I think it’s time I leave it to her and find my own but until then, this will still be my go-to. Ingredients: Aqua/Water/Eau, Aloe Barbadensis (Aloe Vera) Leaf Juice, Glycerin (vegetable glycerine), Butyrospermum Parkii (Shea) Butter, Caprylic/Capric Triglyceride (vegetable derived), Prunus Amygdalus Dulcis (Sweet Almond) Oil, Glyceryl Stearate (naturally derived), Cetyl Ricinoleate (derived from vegetable oil), Cetearyl Alcohol (vegetable derived), Cetearyl Glucoside (derived from corn sugar – and vegetable oil), Lanolin, Cera Alba/Beeswax/Cire d’abeille, Adansonia Digitata (Baobab) Seed Oil, Pancratium Maritimum (Sea Daffodil) Extract, Kigelia Africana Fruit Extract, Chondrus Crispus (Carrageenan moss) Powder, Adansonia Digitata (Baobab) Fruit Extract, Allantoin, Citrus Aurantium Bergamia (Bergamot) Peel Oil, Citrus Limon (Lemon) Peel Oil, Lavandula Angustifolia (Lavender) Oil, Cassia Angustifolia Seed Extract, Cananga Odorata (Ylang Ylang) Oil, Juniperus Communis (Juniper) Oil, Vetiveria Zizanoides (Vetiver) Oil, Hibiscus Sabdariffa Flower Extract, Rosmarinus Officinalis (Rosemary) Leaf Oil, Tocopherol (Vitamin E), Citric Acid (derived from corn sugar), Benzyl Alcohol, Sodium Stearoyl Glutamate (naturally derived), Hydroxyacetophenone (preservative booster), Dehydroacetic Acid (ecocert preservative), Sodium Benzoate and Potassium Sorbate, Limonene*, Citronellol*, Geraniol*, Citral*, Linalool* (*naturally occurring in essential oil). Since discovering the absolute joy that is Aurelia a few months ago I have seriously fallen hard for the brand and am so excited about all their new launches. First up, is their beautiful hand cream that does more than just smell amazing, it also works to reduce pigmentation and brighten, as well as hydrate and nourish for the smoothest, softest hands. It has a wonderful list of ingredients like sea daffodil to diminish discoloration, red algae to protect the skin and a mix of Vetiver, Ylang Ylang, Lavender and Patchouli for the loveliest, relaxing scent. This would be the perfect nighttime hand cream because it’s more like a treatment product and the aroma would lull anyone into a blissful sleep. The packaging is gorgeous and the light, non-greasy texture means this hand cream is quickly becoming one of my all time favourites, but I expect nothing less when it comes to Aurelia. Next up from them is the little pot you see in the picture above which is a sample of their soon to be released all natural deodorant, which I am calling a “future favourite”. I used this every day for a week and am so pleased to report that it actually worked! It obviously does not stop you from sweating (that’s a good thing btw) but it does prevent any unpleasant underarm odors and after trying many green deodorants, I’ve found that’s not an easy thing to do. It has a lovely smooth, creamy texture and the scent is a light floral and herbal combination that didn’t irritate my skin or overpower my perfume. Of course, as I don’t have the full ingredients list yet and only used it for a week this is more like an honorary favourite but I honestly think this is going to do so well and I can’t wait for the official launch. Another soon to launch product from one of my favourite brands is this beautiful lip balm from the lovely Queen Bee T and Esme over at Therapi. As you know, I am pretty obsessed with this bee alchemy brand and have been loving this little pot of honey nectar. It is very, very lightly scented, has a buttery smooth texture and melts into the lips beautifully. This is one of the nicest lip balms I have tried and the packaging is so cute. Therapi are also releasing their travel sets soon and I am so happy they’ve done this. Not only does it make it easier for customers to try the brand but now I have a mini of my favourite toner! To celebrate I will be hosting a giveaway of this lip balm and the the travel sets very soon, so stay tuned for that one because the products are just darling! Ingredients: Water, Ethyl Alcohol, Aloe Essence, Hydrogenated Triterpene Mixture, Fulvic Acid, Phenoxyethanol. I first discovered the brilliant Phylia [de M.] range a few years ago through Victoria Health during a time when I was very ill and looking for a vitamin regime to improve my health (more on that later). Fulvic Acid is the brand’s star ingredient and this leave-in conditioner uses it to prevent and reduce hair loss and thinning, strengthen existing hair and restore the body’s ability to grow healthy hair. This is such an important product for me because when I got sick my thick, full and healthy hair started to shed like crazy and it was really scary and upsetting. Luckily, once I got well again, all that stopped but now taking care of the health and condition of my hair is a priority and this has been such an effective new addition. It works to detox, repair and renew the cell life and function of the scalp, hair and follicles. Fulvic Acid encourages cell regeneration, tannic acid repairs damaged cells and the aloe blend is soothing. I have been using this for about two months after every hair wash and it has absolutely helped to reduce any excess shedding and restore the overall health of my hair and scalp. The shampoo and conditioner will be in my empties, so I wont say too much about those but I am loving this range. The crazy thing is you can use this product on your face too and even though I haven’t done it yet, I really want to. There is also a Re-Connect treatment that I believe is the supercharged version of this, which sounds amazing and after remembering how great fulvic acid is, I will be getting the supplement again. As with our skin, good hair starts from within and Phylia [de M.] really understand and advocate that. You can read more from the founder about the products, hair health and fulvic acid here. Ingredients: Cover Click – Caprylic/Capric Triglyceride, Polyglyceryl-2 Triisostearate, Diisostearyl Malate, Synthetic Beeswax, Ozokerite, Squalane, Neopentyl Glycol Dicaprate, Triacontanyl PVP, Copernicia Cerifera (Carnauba) Wax (Cera Carnauba, Cire de carnauba), Silica, Hydrogenated Polyisobutene, C12-15 Alkyl Benzoate, Dehydroacetic Acid, Ethyl Linoleate, Ethyl Linolenate, Triethoxycaprylylsilane, Tocopherol, Tribehenin, Ethyl Oleate, Tetrahexyldecyl Ascorbate, Bisabolol, Phytosphingosine, Ceramide NG, PEG-10 Phytosterol, Palmitoyl Hexapeptide-12 (+/-) Titanium Dioxide (CI 77891), Iron Oxides (CI 77491, CI 77492, CI 77499), Chromium Oxide Greens (CI 77288). Correct Click -Caprylic/Capric Triglyceride, Polyglyceryl-2 Triisostearate, Mica, Diisostearyl Malate, Synthetic Beeswax, Ozokerite, Copernicia Cerifera (Carnauba) Wax (Cera Carnauba, Cire de carnauba), Neopentyl Glycol Dicaprate, Squalane, Triacontanyl PVP, Silica, Hydrogenated Polyisobutene, C12-15 Alkyl Benzoate, Dehydroacetic Acid, Ethyl Linoleate, Ethyl Linolenate, Tocopherol, Triethoxycaprylylsilane, Ethyl Oleate, Tribehenin, Bisabolol, Tetrahexyldecyl Ascorbate, Phytosphingosine, Ceramide NG, PEG-10 Phytosterol, Palmitoyl Hexapeptide-12 May Contain/Peut Contenir: Iron Oxides (CI 77491, CI 77492, CI 77499), Titanium Dioxide (CI 77891), Yellow 5 Lake (CI 19140), Manganese Violet (CI 77742), Chromium Oxide Greens (CI 77288), Red 40 Lake (CI 16035). Enhance Click – Caprylic/Capric Triglyceride, Polyglyceryl-2 Triisostearate, Synthetic Fluorphlogopite, Mica, Diisostearyl Malate, Synthetic Beeswax, Ozokerite, Squalane, Neopentyl Glycol Dicaprate, Triacontanyl PVP, Copernicia Cerifera (Carnauba) Wax (Cera Carnauba, Cire de carnauba), Hydrogenated Polyisobutene, C12-15 Alkyl Benzoate, Dehydroacetic Acid, Ethyl Linoleate, Ethyl Linolenate, Tocopherol, Tribehenin, Ethyl Oleate, Tetrahexyldecyl Ascorbate, Bisabolol, Phytosphingosine, Ceramide NG, PEG-10 Phytosterol, Palmitoyl Hexapeptide-12, Titanium Dioxide (CI 77891). As many of you know from my previous blog post (here), I am slowly but surely making my way back to the wonderful world of makeup and these have been such a happy discovery. 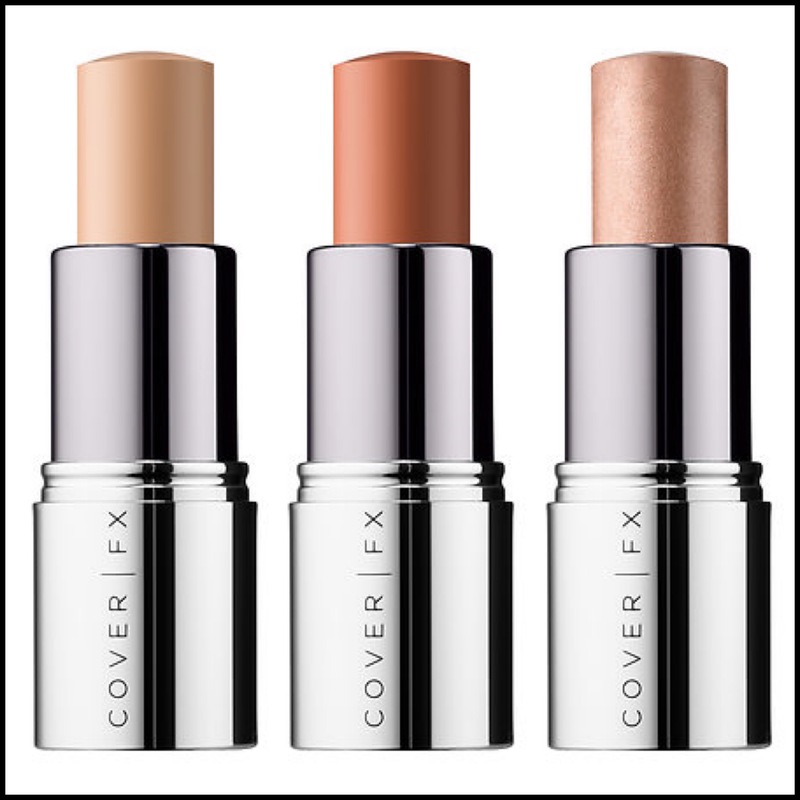 Cover FX have really nailed it when it comes to easy, effortless summer makeup and I have been loving these cute Cover, Correct and Enhance sticks. I will be doing a separate post on these as I have quite a few but my favourites so far have been the foundation in G50 for concealing, the orange corrector for under eye perfecting (although I think I need peach but it’s currently sold out) and Rose Gold for a beautiful, subtle highlight. This is my first time using anything from Cover FX and I am seriously impressed. The sticks are so easy to use and leave a flawless, natural finish – I just swipe them on and blend out with my fingers for a sheer, undetectable finish. These would be perfect for traveling or just keeping in your bag for touchups on the go. Love! Great product selection l love these type of posts, they also give me an idea of what I can try and what to carry while traveling. Thank you my love! So glad you liked the post. 🙂 Oh, the Byredo. I am obsessed!